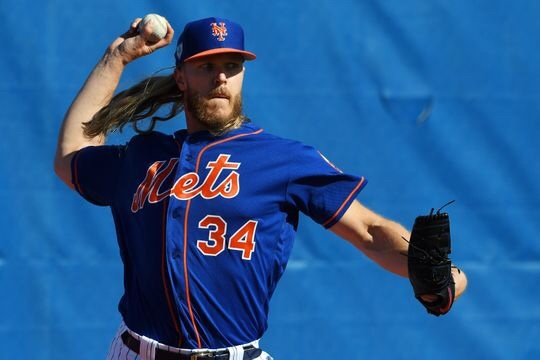 Mets RHP Noah Syndergaard hit the bump in Saturday’s exhibition game and while he wasn’t as sharp as we’d like to see, we have to understand that this is just his second outing of the spring, he’s accumulated 4.2 innings so far. After walking five and tossing 51 pitches in Saturday’s game against the Astros, Callaway removed Syndergaard from the game. He pitched 2.2 innings while walking five, striking out four, and giving up a unearned run while trying to induce a Michael Brantley double play. He also allowed three stolen bases, two of which that belonged to George Springer. He didn’t allow a single hit. However, before today’s game, Syndergaard told reporters that he plans to work on his four seam fastball up in the zone. While Syndergaard is already known for being the hardest throwing pitcher in the league, it’ll be really interesting to see what he looks like after he gets more comfortable with what he’s trying to accomplish. If the Texas born righty does get to that point, I expect his tremendous curveball ball or “Thor’s Hammer” to be absolutely devastating to whoever is standing in that box. Now there’s no question that Noah needs to work on his pick off move over to first base, but at the same time, if that’s not a realistic probability, than I agree with Noah focusing on being the most dominant pitcher in the league with that 100MPH heat. Previous Mets Outfielder Michael Conforto slams a homerun off of Kate Upton’s husband.